This year’s Rooms with a View 2013 was the 19th year of one of my favorite design events in Connecticut. Originally conceived by Albert Hadley, the popular fundraiser transforms the Southport Congregational Church into a showhouse featuring twelve tiny 5′ x8′ rooms created by local and NYC designers. 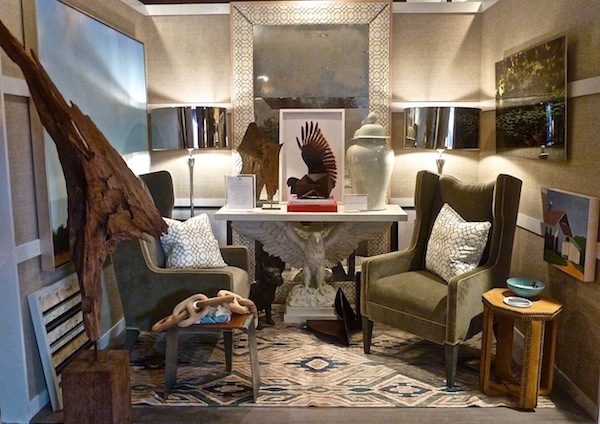 This year’s version, again under the directorship of Honorary Chairman and Parish Hadley alumnus Thom Filicia celebrated Americanism: Timely and Timeless Design. With a fresh crop of contributing designers, the vignettes were creative, fun and fresh. 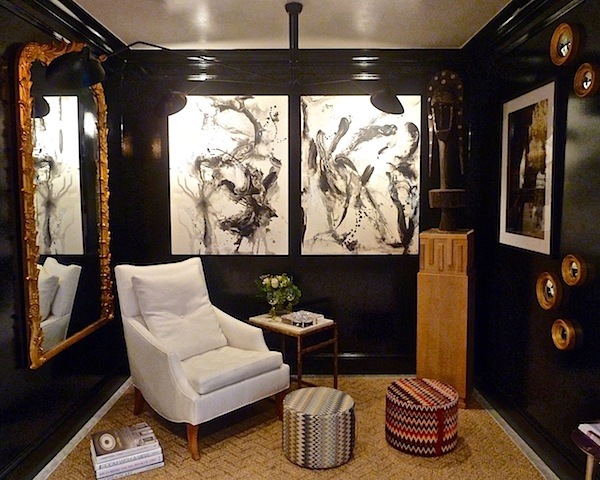 Thom Filicia‘s particular brand of Americanism is a casual eclectic chic as expressed in his room, featuring pieces from his collections as well as his new Sedgewick and Brattle space. 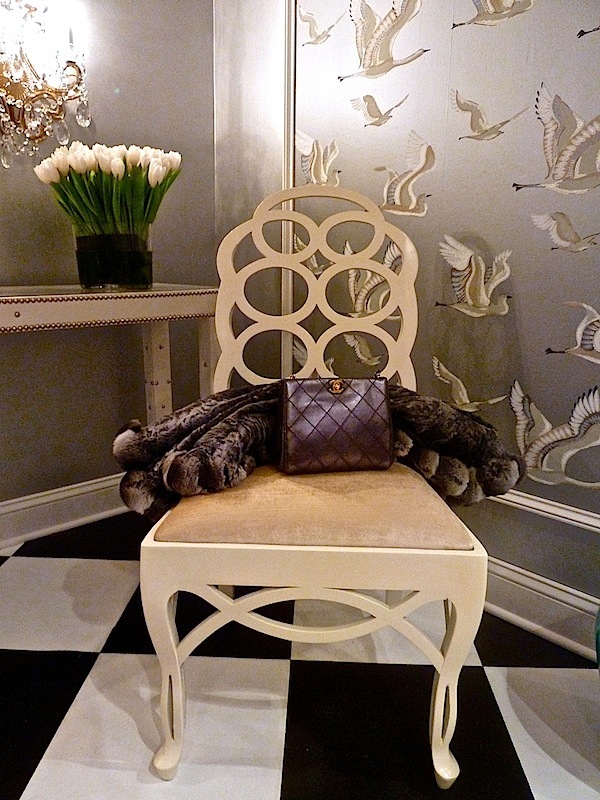 Westport designer Lynne Scalo‘s room was an art-filled dark and glamorous space. 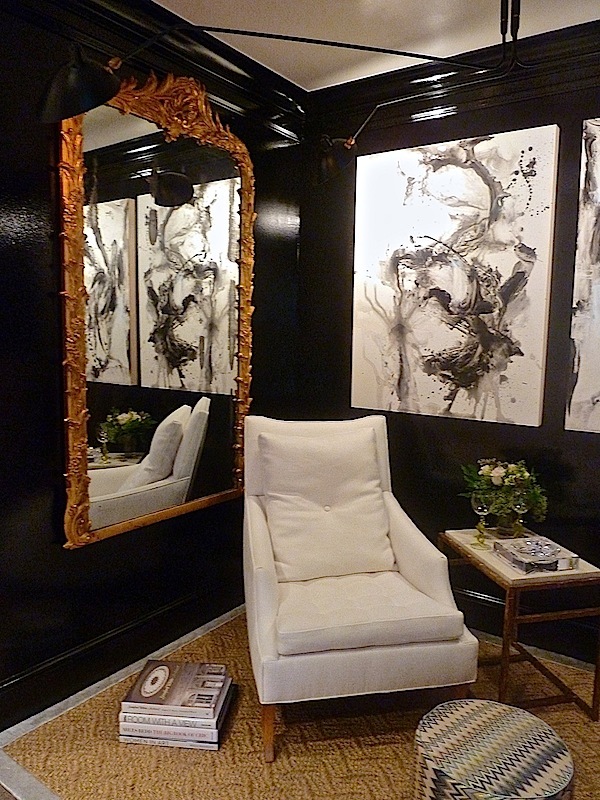 Glossy Farrow & Ball Pitch Black walls were the perfect foil for the dramatic paintings by Jeannie Motherwell. A study in contrasts, a Serge Mouille light hangs with Scalo’s Louie the XV Mirror for a thoroughly modern mix. Next door, an elegant approach to vintage glamour was stylishly executed by the mother and daughter design team behind Ruger Interiors. 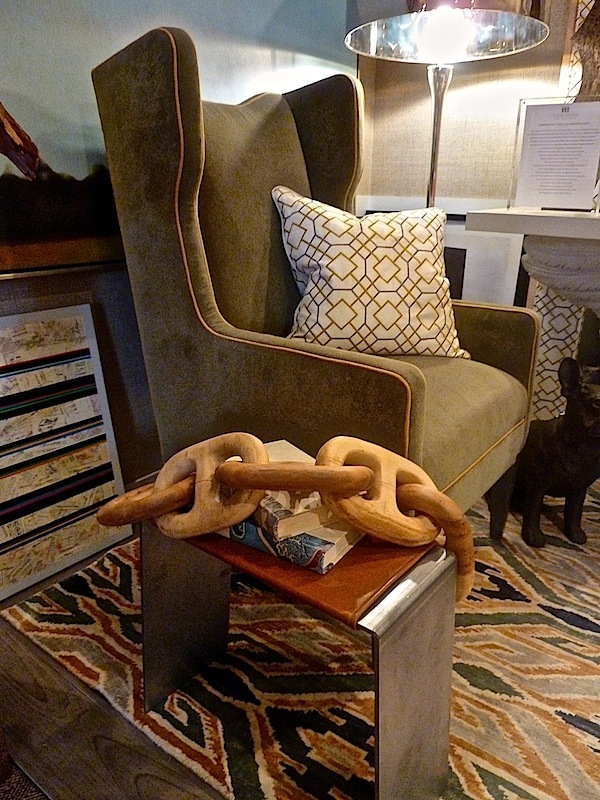 An ode to Francis Elkins included an original pair of her iconic Loop Chairs and console in a foyer reminiscent of her classic early 20th century designs. 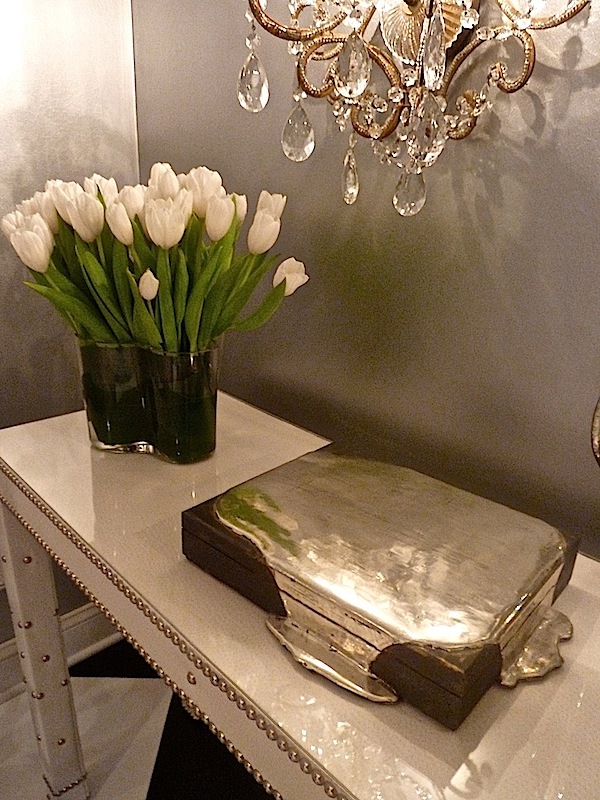 A 1940’s Stanley Hura Hollywood Regency mirror and French sconces from the 30s added reflective allure. 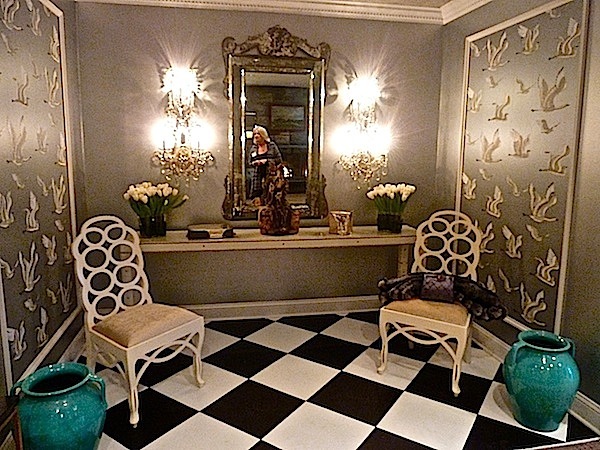 Designer Bryant Keller created a timeless room of classic American appeal. 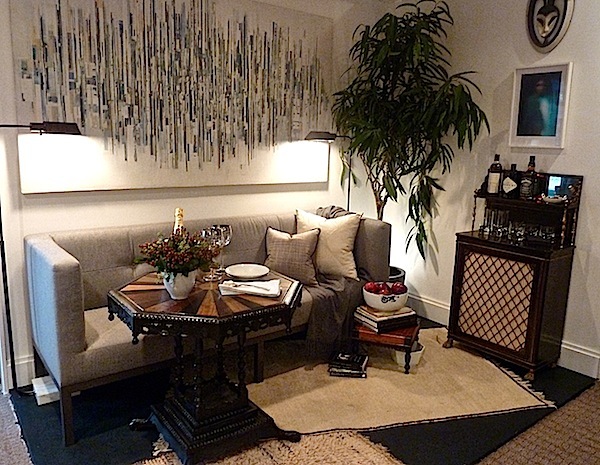 A small yet stylish space, it would be perfect for cozy holiday entertaining. I was excited to meet Nancy Corbett and learn about her new company Corbett Wright. 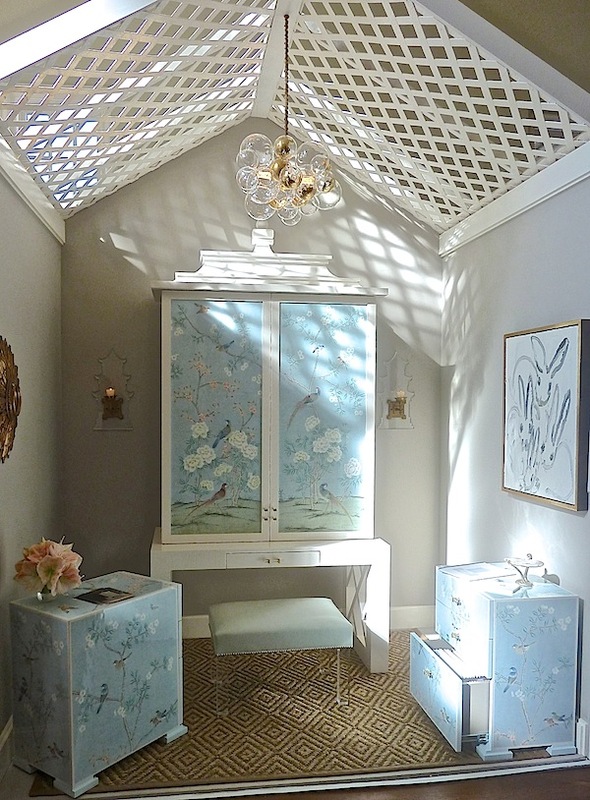 In a simple but charming trellis-roofed space, she exhibited her line of customizable furniture. 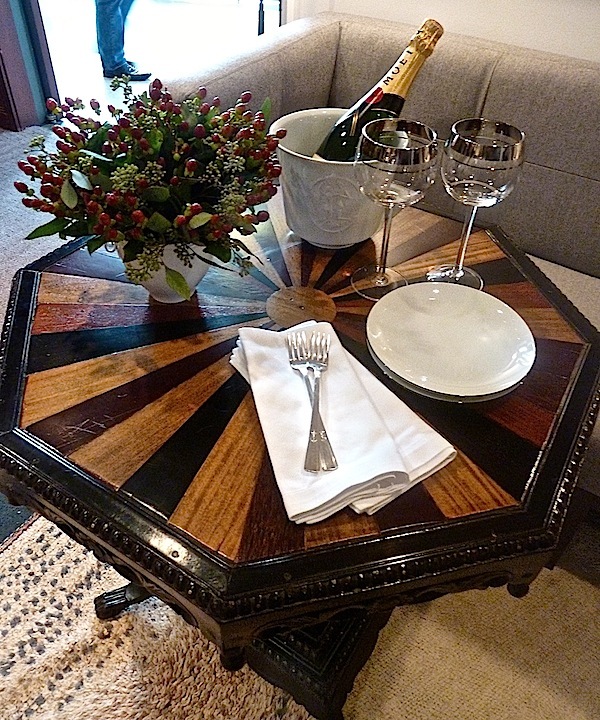 Nancy’s pieces are chic and practical solutions to contemporary design challenges. As she says, “We believe in timeless design with modern purpose.” The signature piece shown at the show was her Pagoda, below. 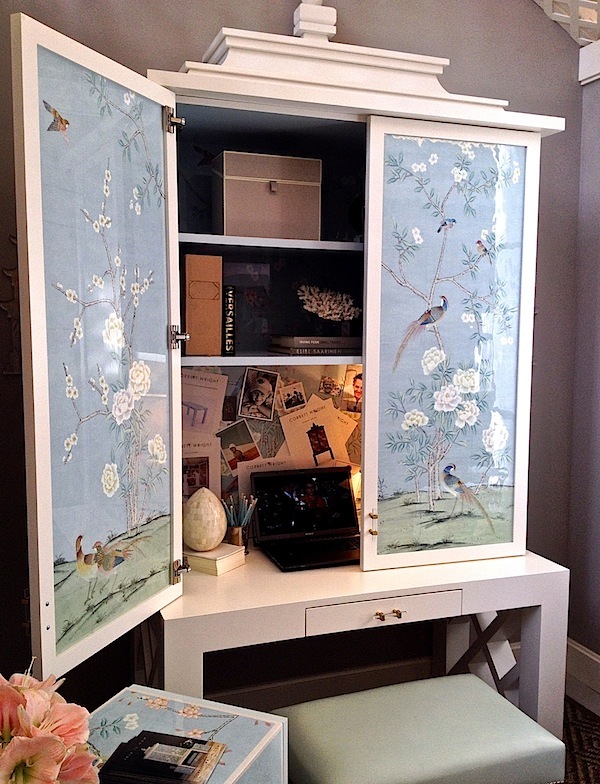 Perfectly suited to home office, but beautiful enough for anywhere in the home, it is an organizational dream. Including hidden surge protectors for up to 10 devices, all electrical cords are hidden for a totally clutter free appearance. 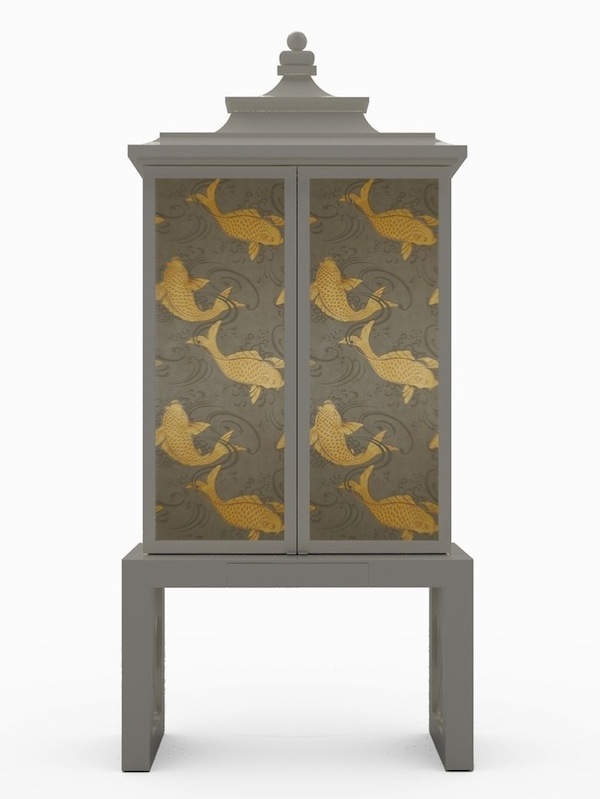 The designs are proprietary and this Blue Chinoiserie pattern is hand painted for the company in a lacquer-type finish that is not only durable and washable but completely magnetic inside and out. I knew it was a good sign when I noticed that one of my all time favorite movies was looping on the laptop. 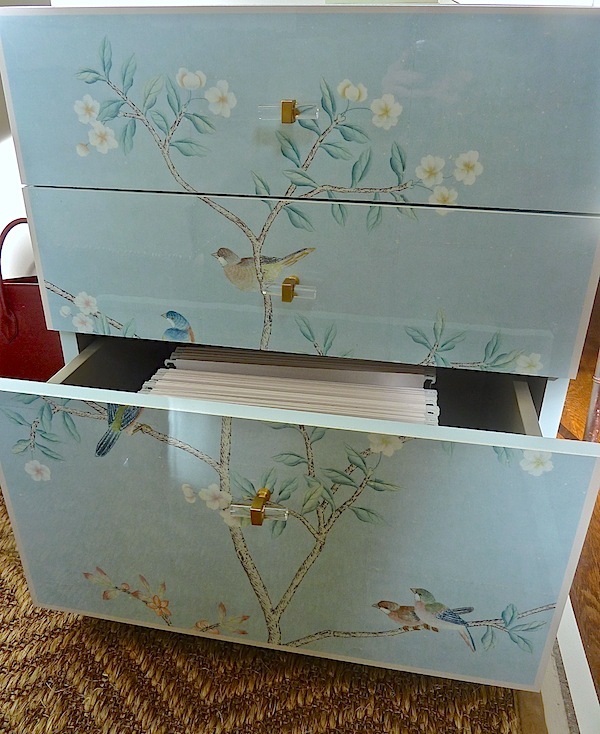 Nancy also brought two different configurations of side table/file cabinets in the same design that included thoughtful touches such as pretty lucite and brass hardware. 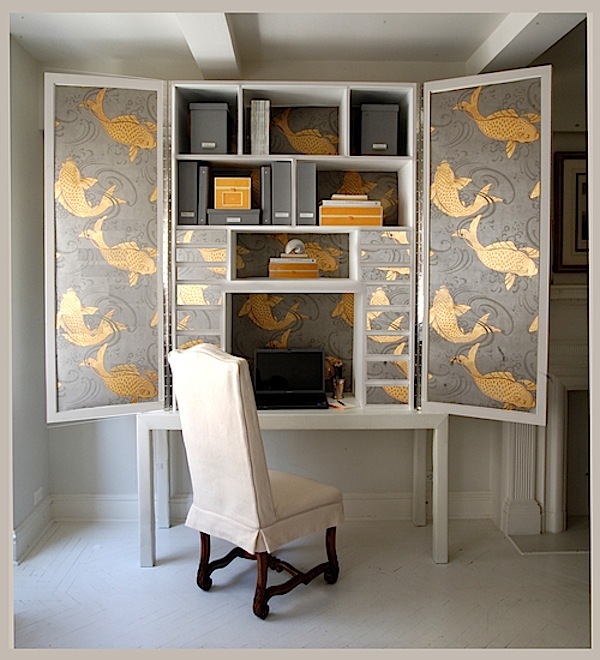 including more storage such as cubbies or drawers, or additional shelving. I look forward revisiting this company at a future date. In the meantime, do stop by next time as we visit more rooms from Rooms with a View 2013. This entry posted in art, design, furniture, interior design. 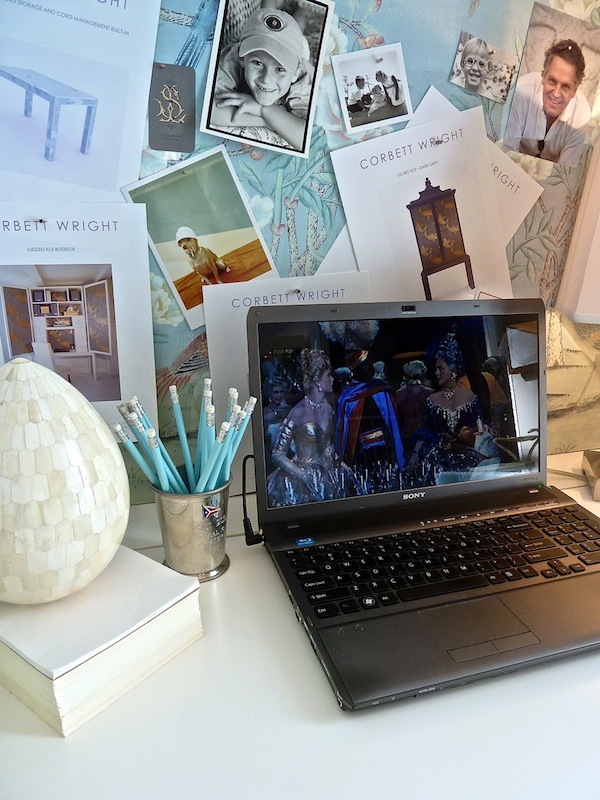 Entry Tags: Corbett Wright, interior design, Rooms with a View 2013, Showhouse Bookmark the permalink. Wow….this year was filled with incredible talent!!! Love every room, but must say the Nancy Corbett room really made an impression! Hope all is well. Stay warm today! The Nancy Corbett room gets my vote too! Oi Koi! 78 queries in 0.446 seconds.